The Magellanic Plover is an enigmatic shorebird confined to the southern tip of South America. Although traditionally included among the plovers [Charadriidae], it is an odd, almost dove-shaped wader that behaves more like a turnstone than anything else (left; an adult photographed by Alvaro Jaramillo). It breeds around upland lakes in Tierra del Fuego, preferring shallow saline lakes with shores laden with salt deposits. It disperses more widely in the non-breeding season, when small flocks reach to coastal Patagonia (Piersma 1996, Jaramillo 2003). It has a number of features not shared with other plovers, including the habit of turning seaweed and stones to uncover invertebrates, and digging in the sand with its short legs for buried prey. Magellanic Plovers carry food to their chicks in the crop, a pouch which can also be distended in display (Piersma 1996). separate from Charadriidae" (SACC 2006). This is not the only way to look at the data; Dickinson (2003) includes Magellanic Plover among the sheathbills in Chionidae. 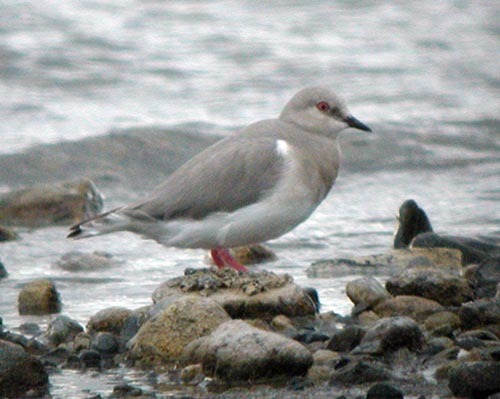 However, it is obviously quite a different bird from sheathbills — even if they are the closest living relative — and so it seems best to elevate this odd shorebird to its own family at this point. The Magellanic Plover breeds on high-elevation lakes in the austral spring (Sep-Nov) where pairs are solitary and defend territories vigorously. Generally two eggs are laid, and incubated by both parents, but if both hatch, the weaker check usually does not survive (Jehl 1975, Piersma 1996). Juvenal-plumaged birds (right, in another fine Alvaro Jaramillo shot) are heavily scaled with white and the legs are yellowish, rather than bright pink-red as in adults. It is often said that the elevation of Magellanic Plover to its own family is a Sibley & Monroe (1990) innovation, but this is not true. Sibley & Monroe (1990) listed it almost dead-center among the plovers in family Charadriidae, and cited only Jehl (1975) for its placement. However, Charles Sibley (1996) elevated it to family status in his diskette update to Sibley & Monroe after Burt Monroe's death. Yet event the very text that make this proposal acknowledged that the suggestion was not based on biochemical evidence (unlike all their other DNA-DNA hybridization work) but instead was grounded in its unique behavioral characteristics. Sibley's suggestion was entirely philosophical: "Placing it in a monotypic family calls attention to its unique or unusual features and may attract additional study." Clements (2000) then followed Sibley (1996) to consider it a separate family. Piersma (1996), in the Handbook of the Birds of the World series, did not. It is only the more recent biochemical evidence (Paton et al. 2003) that now permits us to support what had been a seemingly premature family designation in the 1990s. 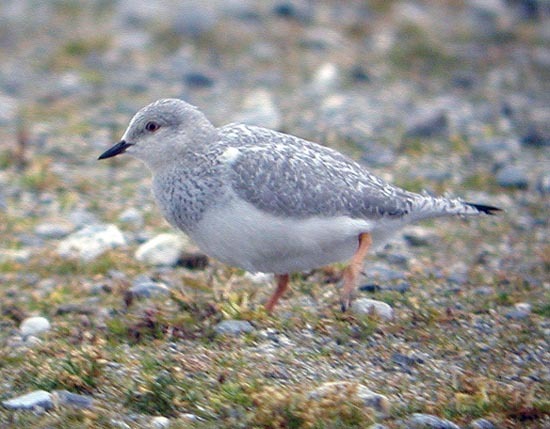 Photos: Both photos of Magellanic Plover Pluvianellus socialis were taken by Alvaro Jaramillo at Laguna de los Cisnes, Tierra del Fuego, Chile, on 31 Jan 2004. All photos © 2006 Alvaro Jaramillo, used with permission; all rights reserved. There is no "family book" for Magellanic Plover but a fine introduction is in Piersma (1996). Chu, P.C. 1995. Phylogenetic reanalysis of Strauch's osteological data set for the Charadriiformes. Condor 97: 174-196. Clements, J.F. 2000. Birds of the World: A Checklist. 5th ed. Ibis Publ., Vista, CA. Jaramillo, A. 2003. Birds of Chile. Princeton Univ. Press, Princeton. Jehl, J.R., Jr. 1975. Pluvianellus socialis: biology, ecology, and relationships of an enigmatic Patagonian shorebird. Trans. San Diego Soc. Nat. Hist. 18: 25-74. Paton, T.A., A.J. Baker, J.G. Groth, and G.F. Barrowclough. 2003. RAG-1 sequences resolve phylogenetic relationships within charadriiform birds. Molecular Phylogenetics & Evolution 29: 268-278. Piersma, T. 1996. Family Charadriidae (Plovers), pp. 384-443 in del Hoyo, J., A. Elliott & J. Sargatel, eds., Handbook of the Birds of the World. Vol. 3. Lynx Edicions, Barcelona. Sibley, C. G., and B.L. Monroe, Jr. 1990. Distribution and Taxonomy of Birds of the World. Yale Univ. Press, New Haven, CT.
South American Checklist Committee (SACC). 2006. Checklist of the Birds of South America. On-line; J.V. Remsen, Jr., et al., eds. Strauch, J.G. 1978. The phylogeny of the Charadriiformes (Aves): A new estimate using the method of character compatibility analysis. Trans. Zool. Soc. Lond. (B) 34: 263-345.